The Beacon Island is a small rocky outcrop on which Thomas Snodgrass – an Englishman working for the East India Company back in 1791 built a small room and a spire. Snodgrass was (tax) Collector of Ganjam District during this period and quickly worked out that he could make best use of his time there by enjoying a lavish lifestyle on the mainland shooting, trapping and entertaining visitors. 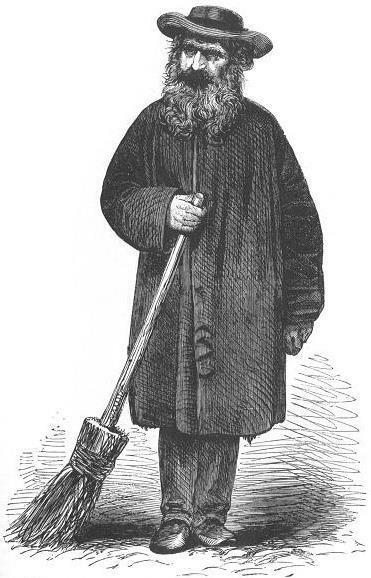 ‘The Bearded Crossing-Sweeper at the Exchange’ from Henry Mayhew, London Labour and the London Poor volume 2. He built a big lakeside mansion with space for his horses and elephants. He progressively spent more time reading and hanging out on Beacon Island (which became his office). Revenue from the district fell and rumours of his lifestyle reached the Company’s office in Madras. Snodgrass ignored their letters, threatened to shoot a Mr Brown from the Company sent to relieve him of office. He played on the remoteness of his outpost which took months to reach by road and was cut off by sea during the Monsoon season. The Governor sent a small body of soldiers to bring him back so Snodgrass sent all tax records out into the middle of the lake and sank them (claiming it was an accident). Snodgrass was eventually removed from office and denied a company pension. In London he fought back by becoming a street sweeper in front of East India House which enabled him to confront the pompous and wealthy directors every day. They gave in to escape the public ridicule he had brought upon them and Snodgrass got his pension.